Going to see Dr. Corvette was a decision I made that may have just saved my life. I had a dark and purplish spot on my ear that looked funny to me. I went to see my family doctor and she gave me a list of Dermatologists to try to get an appointment with. Lucky for me I chose the right one, Dr. Donna Corvette. I went to see her and she did a biopsy just to be on the safe side. I came back for my results and there it was on paper, melanoma cancer, and it was all mine. This is not the kind of skin cancer you just cut off and go on living your life. It was much deeper than that. 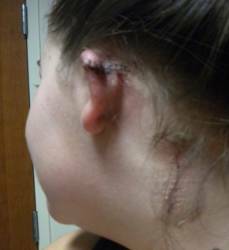 I had to undergo two surgeries; one removing 1/3 of my ear, and one that left me with a scar starting behind my ear and running down across my neck and to the middle of my throat. 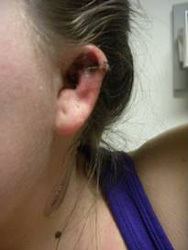 Front of my ear after first surgery to remove the melanoma. This was also not the end of the road towards my battle. The melanoma had spread deeper and reached my lymph nodes, which was the cause for the second surgery. I also had to take a type of chemotherapy for 5 days a week, 4 weeks in a row. Most people think of skin cancer as no big deal, cut it off and go on. Not for me, not this time. I was in constant pain from surgery and chemo for almost 6 months. I was diagnosed on December 20, 2010, on January 10, 2011 I went in to see Dr. Hoefer for my first surgery. In March I had my second surgery with Dr. Karakla and then I started chemotherapy in April. Incision and drainage tubes after my second surgery to remove the lymph nodes from my neck. 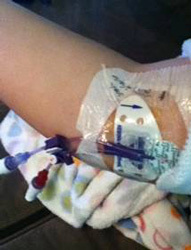 The PICC line was put in my arm so I was able to get chemo every day. The pole I was connected to for 5 days a week for 4 weeks in a row that my chemo was administered from. 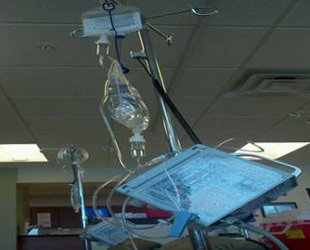 May 6, 2011 was my last day of chemotherapy and marks my day I am in remission. May, 6 2012 I will have been in remission for one full year. This past year has not been easy. I still went to see Dr. Harden every three months to get blood work done and have an exam to make sure the cancer has not come back. I also went to see Dr. Corvette every three months for a complete skin check to make sure that there were no new spots of concern. I suffered through all of this because of a tan. I went to the tanning bed at least two times a week; I also went to the beach and the pool with no sunscreen. All because I wanted to be tan and that is one mistake I plan to never make again. It makes me sad seeing these young girls go in and out of tanning salons, I want to protect them from dealing with what I was faced with when I was only 19 years old. Now I spray tan, and it is the best feeling in the world knowing I can still be tan without harming my body. Smart girls fake it, fake tan that is!